Tue., June 12, 2018, 8:59 a.m.
Maybe it took just a week, or perhaps the past two months. Maybe it took a quarter of a century. But be clear about this, as Constitution Avenue is blocked off for a parade: Washington changed as a sports town. The Capitals did that on their own, and their hedonistic tear through this starched-collar city over the weekend shows what we missed all these years. Oh, for GIFs of Riggo and the Hogs a generation ago, just so we could compare it to belly-flopping Ovi in the fountains along the Georgetown waterfront. Now, though, we don’t have to look back decades to understand how Washington and its surrounds would react to a championship. We know. Tuesday’s parade will be just another data point. But as a group, Washington’s fans have nothing to prove. They proved it. Okay, we’re not here to bum anyone out. Let’s leave that situation to the side. What exists now is connective tissue. The Capitals’ victory Thursday night in Las Vegas served to tear off the Band-Aid not just for the famished fans who packed into Capital One Arena to – and let’s not undersell this – watch the game on television. This was to show the entire town what can be done, and how the denizens of the District will react. So it mattered not only that Zimmerman and Max Scherzer led the pregame “Let’s Go Caps!” cheers prior to Game 4 of the Stanley Cup finals against Vegas. It mattered just that they and other Nationals were in the building, that they soaked in the crowd. What the Nationals always felt could happen – bringing a trophy to this town – was happening in front of them. “I got chills,” said Bryce Harper, who happened to be supporting his hometown Knights – but soaked in what he saw from the only city he has known as a professional. I’m not here to suggest that the Capitals breaking through means the Nationals will do the same this October. Let’s not connect those dots just yet. Still, the storm clouds don’t quite gather like they once did. And by “once” I mean two months ago. Zimmerman knows, just like Alex Ovechkin knew. Zimmerman made his debut with the Nationals Sept. 1, 2005. Ovechkin’s first regular-season game with the Capitals came Oct. 5 of that same year. 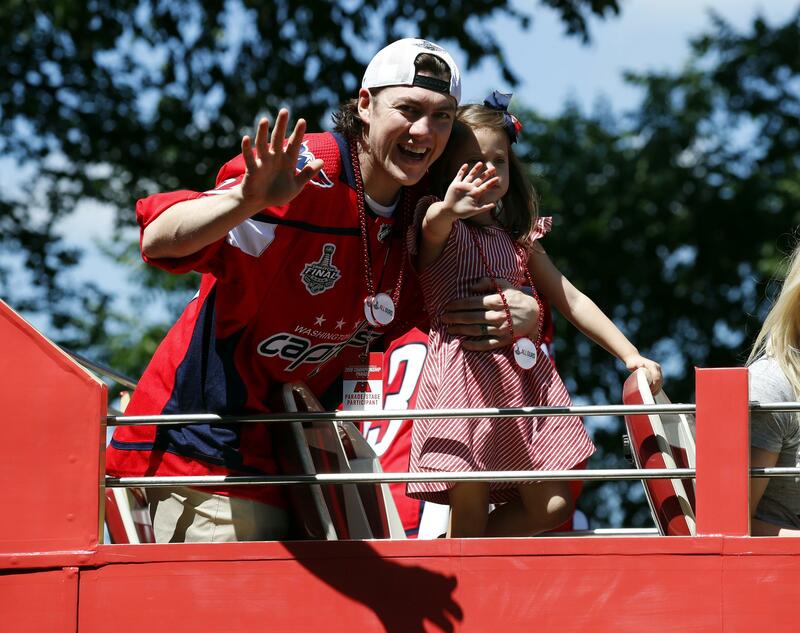 They used to run into each other on the town, along with Nicklas Backstrom and former Cap Mike Green – young guns in the city, expecting titles. Now, both are in their 30s. Both are married. Zimmerman has two kids. Ovechkin has a child on the way. And when Ovechkin walked into the Nationals locker room Saturday, where he and the Caps hung with the Nats before they celebrated in a pregame ceremony, the Capitals captain walked directly to the longest-tenured athlete in town. Which could apply to the baseball team, too. The Capitals showed the Nats – and, presumably, the Wizards and Redskins, too – that getting back up and trying again doesn’t end only in heartache. They showed fans in this town that faith and hope are dangerous, sure, but they don’t have to be deadly. That’s the other aspect the Capitals helped reveal: This is no minor-league sports town. Yes, people moved here from all over the country – and the world. Sure, there’s an inherently transient nature to the city that serves as the seat of federal government, and people bring allegiances – to the Chicago Cubs or the Philadelphia Flyers or the Green Bay Packers or whoever – from all over the place. There’s no difference between Vegas native Harper rooting for the Golden Knights and your Pittsburgh-born neighbor backing the Penguins. But the Caps showed that there is passion here. It is real, and it is broad. It’s not limited to the 18,506 people who have filled Capital One Arena for the past decade, selling it out every night. Given the chance, it spills into the streets and packs the bars and makes a city with a stuffy reputation feel like New Orleans at Mardi Gras. Not for a month. But for a night – and more. The parade will be the last bit of release, so lap it up. We know how infrequently this happens. At some point, presumably, Ovechkin will stop doing keg stands out of the Stanley Cup, and life will return to normal around here. And yet, it’s a new normal. The Capitals’ championship doesn’t make the Nats or the Wizards or the Redskins any better. But it shows each and every member of those teams how the city would respond to a championship. We no longer have to remember back to a different time in what was a different town. We know: It’s pretty darned good. Published: June 12, 2018, 8:59 a.m.